State Hwy No. 70 & Hampton Rd. 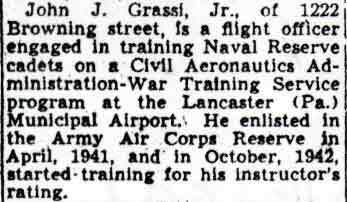 FLIGHT OFFICER JOHN J. GRASSI was born in Camden NJ in 1913 to Mr. and Mrs. John Grassi Sr. John Grassi Sr. had come to America from Italy, sending for his wife and sons Frank and Joseph shortly afterwards. Another son, Rocco, was born in Camden in 1910, before John Grassi Jr. arrived. Another son, Nicola, was born in 1914. 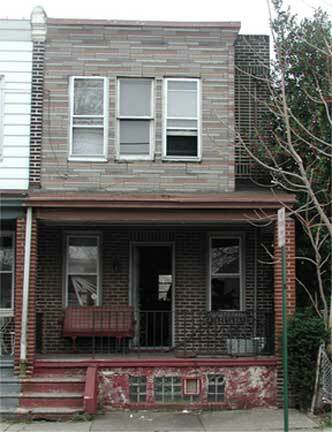 In January of 1920 the family lived at 704 South 3rd Street in Camden NJ. daughters Mary, Angeline, Lena, and Viola all came after the sons were born. John Grassi Sr. worked as a farm laborer, and was still plying this trade in April of 1930. The family by this time was living on Berlin Road in Delaware Township (Cherry Hill) NJ. 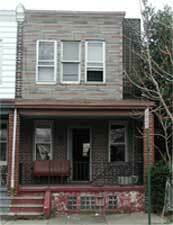 By 1943 his parents had moved back to Camden, living at 1222 Browning Street. John Grassi Jr. had married, and lived with his parents at the Browning Street address. In December of 1943, the Camden Courier-Post printed the article below. 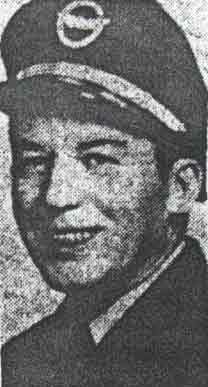 Flight Officer Grassi was reported dead in the 1944 Camden County Centennial book, published in mid-1944. John J. Grassi was brought home to New Jersey, and rests at Calvary cemetery in Cherry Hill NJ.